BRIDGE CONFIGURATIONS Quarter Bridge, Half Bridge or Full Bridge for 120 Ohms, 350 Ohms and 1000 Ohms Strain Gages. The system incorporates internal bridge completion circuitry for 120 Ohms, 350 Ohms and 1000 Ohms Strain Gages. ENGINEERING UNITS Each Channel can be set for user defined engineering units via the Mx+B scaling format. SCANNING RATE 8 Channels per second. BRIDGE FACTOR SETTING 1(QuarterBridge), 2 – Half Bridge, or 4 – Full Bridge or user defined. BRIDGE BALANCE Auto Balancing of All Channels. FULL SCALE STRAIN OUTPUT Selectable: – 1250, 2500, 5000, 10,000, 25,000, 50,000 and 1,00,000 Microstrains. 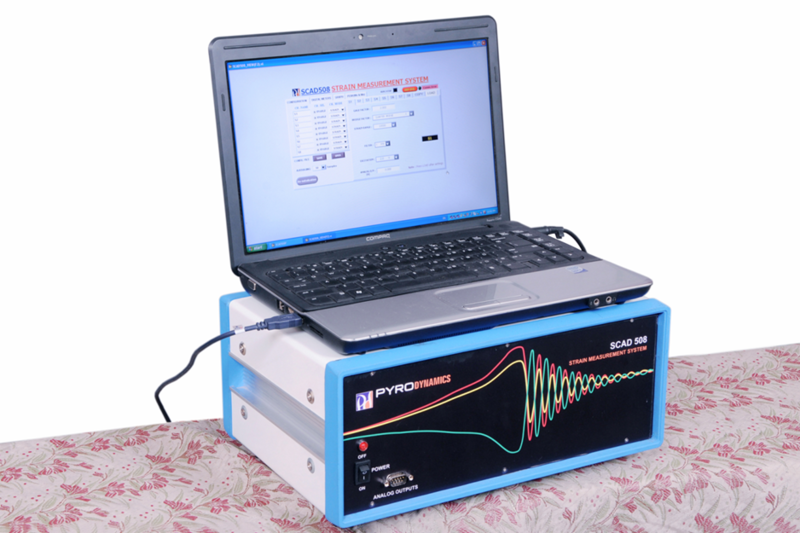 DYNAMIC RESPONSE The Analog Output of each channel provides a Dynamic Response of DC to 50 kHz (Flat) for recording in an External recorder or Data Acquisition Card.Roll off from 50 to 150 kHz . FILTER Each Channel of SCAD 508 has a 8th OrderButterworth low pass filter. Software Selectable Cut off Frequencies 10Hz ; 100Hz ;1kHz ;5kHz ;10kHz ; 20kHz ;40kHz ; 50kHz & Wideband (filter disable). CALIBRATION Shunt calibration across the 1000 Ohms passive arm to simulate 5000 Microstrains.